This refreshing bean and veggie salad is perfect for a Summer potluck or a meatless meal at home. It is loaded with fiber, Vitamin C and potassium.The special ingredient that takes this dish to the next level is garam masala, which is very popular in Indian cooking. Have I told you that I could eat Indian every single day if I was allowed to?! There is a local Indian Restaurant by our house that caters to gluten-free eaters and I adore it. Since eating out regularly is not something our family does, I am trying to incorporate more Indian spices to the dishes I make at home. Garam masala makes my house smell almost like the restaurant. It invigorates the senses. I love the stuff. Saute onion in olive oil in a saute pan over medium heat for 5 minutes. Add in the rest of the ingredients and stir well. Cook for another 10 minutes stirring regularly. Serve! This is linked to Whole Food Fridays, Gluten-Free Wednesdays, Allergy-Free Wednesdays, Fit and Fabulous Fridays, Fresh Bites Friday, Friday Food, Fight Back Friday, Friday Food Flicks, Simple Lives Thursday, Thriving on Thursdays, Full Plate Thursday, Tastetastic Thursday, Healthy 2 Day Wednesdays, Whole Food Wednesdays, WLWW, Frugal Days, Sustainable Ways, Hearth and Soul Hop, Totally Tasty Tuesdays, Traditional Tuesdays, Fat Tuesday, Slightly Indulgent Tuesday, Better Mom Mondays, Melt in Your Mouth Monday, Made From Scratch Monday, My Meatless Mondays, Inspire Me Monday, Flour Me with Love, Monday Mania and Wellness Weekend. This refreshing salad is bursting with flavor from cilantro and lime. Cilantro is an anti-inflammatory and is a good source of iron and magnesium. Avocados contain ample amounts of fiber, folate, Vitamin K and potassium. Black beans are rich in fiber, folate, iron and protein. The pictures don’t do this salad justice–my husband asked me to make this salad twice last week. The dressing makes everyone come back for more! Heat black beans in a small pan over medium heat for 5 minutes. Add all of the ingredients to a large bowl. Stir thoroughly with a large spoon for a minute. Make sure the greens and beans are well coated with the mashed avocado and lime juice. Enjoy! This was shared on Lunchbox Love, Fit and Fabulous Fridays, Freaky Friday, Fresh Bites Friday, Fight Back Friday, Wellness Weekend, Pennywise Platter, Simple Lives Thursday, Tastetastic Thursday, Gluten-Free Wednesdays, Frugal Days, Sustainable Ways, Healthy 2 Day Wednesdays, Real Food Wednesday, Whole Food Wednesday, Hearth and Soul Hop, Fat Tuesday and Slightly Indulgent Tuesday. If you have read some of my previous posts, you may know I am crazy about kale. My family loves kale too. My kids enjoy kale when I put it in smoothies or make kale chips. I have to be more creative when it comes to putting kale in a salad. 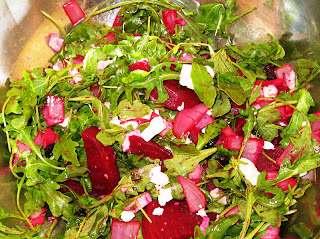 Jazzing up a salad is a must when two young kids will be eating it :)This salad was created several months ago alongside my daughter who insisted she give her approval for each ingredient that went into the salad. Luckily, avocado is one of her favorite foods. I now make this salad once a week and my family adores it. I find avocados pair very well with kale, as do oranges. Kale is an excellent source of Vitamin A, C, E, calcium, fiber and iron. Avocados are rich in Vitamin K, folate and potassium. The fruit in this salad provides an extra dose of Vitamin C. What I like most about this salad is that there is no need for any store-bought salad dressing. I love making my own salad dressing every chance I can. Wash kale thoroughly and dry leaves off. Place kale in a large salad bowl. Add in avocados, oranges, cranberries, olive oil, honey, vinegar and Herbamare. Toss all ingredients together with a large spoon. Serve.Makes 6 servings. P.S. Check out my guest post over at SugarFreeMom for a recipe for Honey Sweetened Valentine Cookies! This recipe is linked to Gluten-Free Support Group, Whole Food Wednesdays, Traditional Tuesday, Sunday School, Real Food Wednesday, Hearth and Soul Hop, Fat Tuesday, Barn Hop, Real Food 101, Better Mom Mondays, Monday Mania, Fight Back Friday, Freaky Friday, Friday Food Flicks, Lunchbox Love, Pennywise Platter Thursday, Simple Lives Thursday, It’s a Keeper Thursday, Tastetastic Thursday, Full Plate Thursday. This salad is beautiful to look at. I love to eat beets-their color is so radiant. Beets are rich in folate, magnesium and potassium. Arugula is rich in Vitamins A and K.
Preheat the oven to 400 degrees. In a large bowl, mix the vinegar, onion, honey, olive oil, sea salt and pepper together. Add in the sliced beets and mix all ingredients again. Place the beets on a greased baking casserole dish and bake in the oven for 20 minutes. 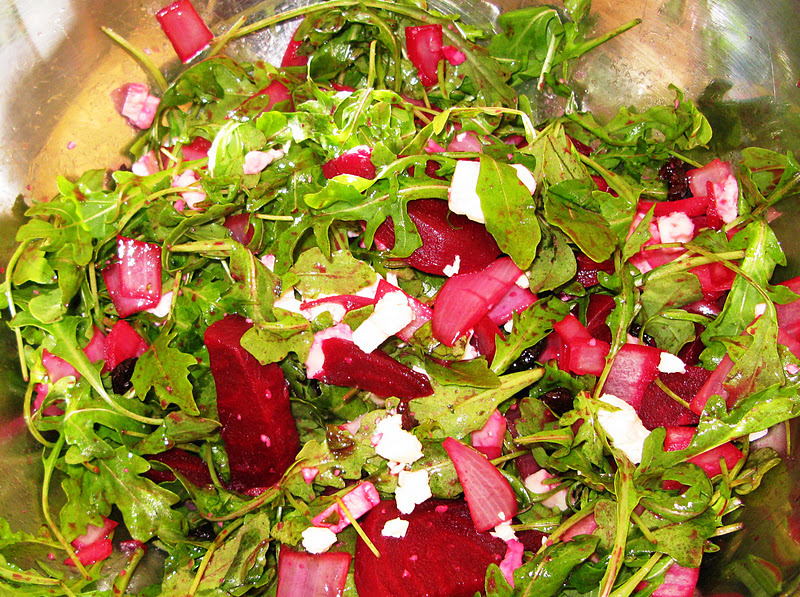 Place the arugula and cranberries into another large bowl. After 20 minutes, add in the beet mixture and toss ingredients. Add any additional salt or pepper if desired. If you would like to make this salad heartier, you could add avocados, sunflower seeds, pecans and/or walnuts to it. This recipe was shared on Fat Tuesday, Calling All Salads, Simple Salad Recipes, Barn Hop, Freaky Friday , Lunchbox Love and Holiday Recipe Exchange.